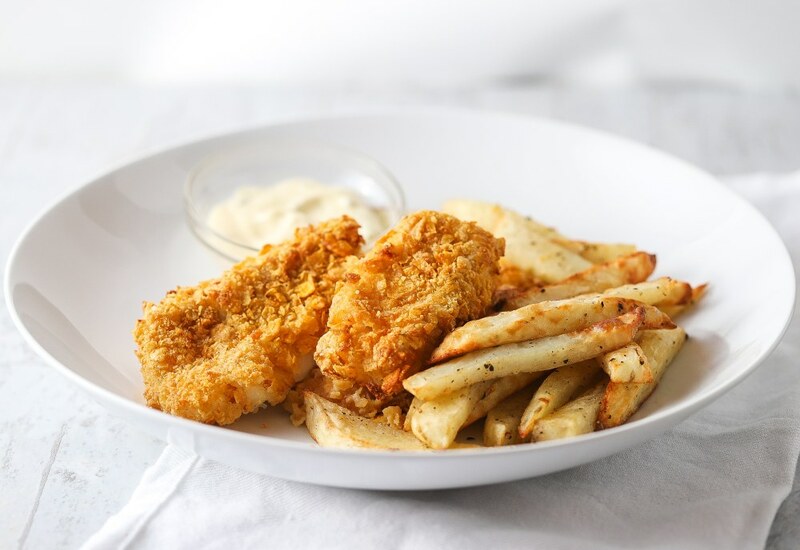 Perfectly crispy fish and chips are easy to make in the air fryer, which also means no more deep frying is needed! Just toss the potatoes in a little bit of oil and coat the fish in a cornflake batter and you've got yourself a quick and easy meal for weeknights or casual get-togethers with family and friends. Serve these fish and chips with your favorite dipping sauce. Make this a gluten-free meal by substituting almond flour or gluten-free flour for the all-purpose flour and make sure the cornflakes are gluten-free. Per Serving: 338 calories; 9g fat; 30.6g carbohydrates; 31g protein; 109mg cholesterol; 814mg sodium.